Acer Aspire E5-571P-59QA is a 15.6 inch touchscreen laptop with multitouch functionality for your everyday computing needs like working on Microsoft Word and Excel or watching a movie and smooth performance of a variety of tasks with is powerful Intel i5 processor and Intel HD 4400 for graphics. It is a great midrange machine at an affordable budget price with even a DVD drive that is not available on many other modern laptops and as little junkware as possible (easy to set-up), offers up to 7 hours battery life and boots up from start in about 25 seconds. Acer Aspire E5 has the power efficient dual core Intel i5-4210U processor (3 MB cache) at 1.70 GHz base speed with turbo boost up to 2.70 GHz and hyper threading to better use the CPU by running two cores in four threads in parallel, 4GB DDR3L SDRAM at 1600 MHz (up to a total of 16 GB max but this is not a particularly easy laptop to upgrade as you may need to disassemble almost the whole unit to upgrade HDD or RAM) to launch apps quickly and multitask properly, 500 GB Serial ATA hard drive at 5400rpm rotating speed that is quite a bit of storage space for most computer users and the latest 64-bit Windows 8.1 operating system with the less number of updates when you first turn it on as pointed out by one of the customers (65 updates as compared to 100 usually) so you shall be up and running in about an hour- after the updates. Glossy 15.6 inch HD widescreen Active Matrix TFT Color CineCrystal LED-backlit touch display with 10-finger multi-touch support, 1366x768 pixel resolution and 16:9 aspect ratio and the integrated Intel HD Graphics 4400 with shared graphics memory offers adequate image quality (better colours and contrast ratios than matte screens for when you’re watching videos or viewing photos)- adequate because this is not as good as a Full HD screen with large viewing angles of IPS panel and you can’t really expect them at this price range but it is at least a well-functioning and responsive touch screen that supports multiple gestures and offers a comfortable user experience with Windows 8.1 apps and tiles. Sound quality is better than what might one expect at this level, with its integrated audio and stereo speakers that seem to work well. It comes with an Acer Crystal Eye HD webcam with integrated microphone for great live chats on Skype. Modern and practical black Acer Aspire E5-571P-59QA weighs 5.46 pounds with measurements of 12 x 1.24 x 10 inches- it has an average weight and is not super slim because of partly having a DVD SuperMulti DL Drive which may come handy to watch movies, play songs or download software from DVDs or CDs but is portable enough and this is also helped by the 6-cell lithium ion 2500 mAh battery that offers up to 7 hours battery life in normal use on a single charge so you will be out all day and not have to hook it up to a power outlet. Keyboard is adequate with a 1.55 travel distance and a 107 x 78 mm size touchpad that supports multiple gestures but a little too close to the left. Other than the optical drive, you have the Miracast enabled 802.11b/g/n wireless for comfy internet access, Gigabit Ethernet LAN (10/100/1000) with RJ-45 connectivity for wired internet, Bluetooth 4.0, SD/SDHC Media card reader, a USB 3.0 port, 2 x USB 2.0 ports, an HDMI port, a VGA port, a Headphone output/Microphone input combo and Kensington Lock Slot. Conclusion: As part of the Acer Aspire E series, the the E5-571P-59QA model- NX.MMSAA.013 offers solid performance- power and speed with the Haswell Intel i5-4210U processor, which is the exact same processor as the 2014 model entry level Apple iMac desktop so it is responsive overall and works smoothly in your everyday tasks and can handle a bit more, such as some multimedia editing and playing less demanding games fluently and modern games at lower settings. Many people complain about Windows 8 but you should get the hang of it in a couple of days and it is a stable platform for whatever you may want to do on the computer and this one has a functional and responsive multi-touch touchscreen and makes life with Windows 8 a hell a lot easier and you have the option to have a Start screen and button similar to Windows 7. Another con would be the hardship of upgrading memory and hard drive on this machine as they are not super easy to access but it sure is doable- just requires extra work than usual. 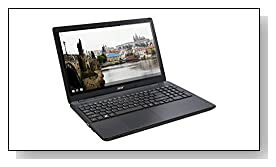 It is a great budget- student and home type computer with midrange specs and touch display that performs well overall with its Intel i5 processor at a very attractive (very high performance to price ratio).